… these presents are under the express condition that the said Earl, his heirs and successors, or their agents, shall annually pay to the Chiefs and warriors and successors, or their agents, shall annually pay to the Chiefs and warriors of the Chippeway or Saulteaux Nation, the present or quit rent consisting of one hundred pounds weight of good and merchantable tobacco, to be delivered on or before the tenth day of October at the forks of Ossiniboyne River—and to the Chiefs and warriors of the Killistine or Cree Nation, a like present or quit rent of one hundred pounds of tobacco, to be delivered to them on or before the said tenth day of October, at Portage de la Prairie, on the banks of Ossiniboyne River. Provided always that the traders hitherto established upon any part of the above-mentioned tract of land shall not be molested in the possession of the lands which they have already cultivated and improved, till His Majesty’s pleasure shall be known. 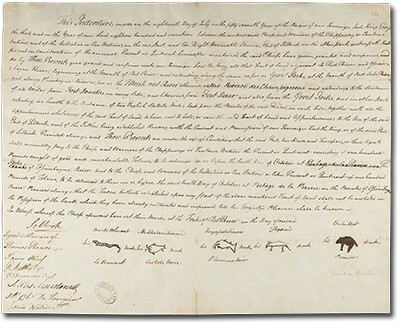 Document 9: Selkirk Treaty (1817) by Sean Kheraj and Tom Peace is licensed under a Creative Commons Attribution-NonCommercial-ShareAlike 4.0 International License, except where otherwise noted.